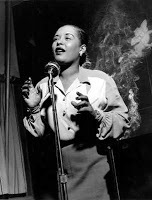 I first heard “Good Morning Heartache” in 1993 (on Terence Blanchard’s previously mentioned Billie Holiday Songbook); I didn’t fall for the song until 1995, when I purchased Billie Holiday’s Complete Decca Recordings. The song is mesmerizing. Billie sings each verse as if she’s lived the lyrics1. Good morning, heartache, what’s new? Jill Scott does a decent turn on the song, but nothing beats Billie. Enjoy!